Is GM About to Recall More Than 100,000 Chevrolet Corvettes? The Chevrolet Corvette is a beloved favorite of thrill-seeking Baby Boomers who have had a lifetime love affair with the car first introduced in 1953, but drivers of more than 100,000 of the sixth-generation Corvette might want to be careful driving at night -- at least for now. 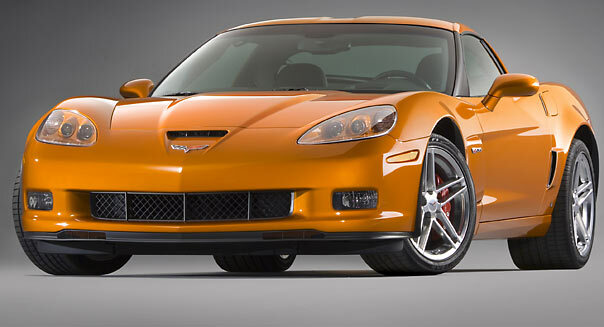 The U.S. National Highway Traffic Safety Administration is looking into 30 reports of a sudden loss of low beam headlight power to the Corvette and the Corvette Z06 coupe manufactured between 2005 and 2007. The agency estimates that 103,374 vehicles could be affected. According to a statement from the country's traffic safety regulator: "In one of the 30 reports, a driver allegedly ran over a discarded tire while attempting to pull off the road. Some complainants reported that the problem is intermittent and some reported that low beam headlight functionality returns after a period of time, typically after the vehicle has been parked." Oddly enough, the sports car's fog lights and high beams aren't affected by the alleged glitch, but of course tooling around with your brights on means a different safety issue: blinding other drivers. "I later determined that the intermittent connection is circuit No. 1970, within the main fuse/relay back plane itself. The circuit opens at operating temperatures, but works when the car fuse box is cold, making diagnoses more difficult. The backplane cannot be serviced and must be replaced." In other words, the engine-savvy car owner says when the fusebox heats up due to its proximity to the engine heat source, the low beam headlights shut down; but at resting temperatures the problem is undetectable. Another complaint said mechanics quote the cost of repair at a huge range, between $600 and $1,200. No accidents or fatalities have been reported. The preliminary investigation was launched on Monday and announced on the government agency's website on Friday. "GM is cooperating with the investigation," a representative from the vehicles' manufacturer, General Motors (GM) wrote in an e-mail to Automotive News. Earlier this year GM unveiled the seventh generation 2014 Corvette C7. Deliveries of the much anticipated new design are expected by the fall. When Chrysler introduced its brand new 300 line in 2005, it met with much success. The 300C was awarded Motor Trend Car of the Year. The vehicle sold extremely well -- nearly 145,000 units in the first year, and 120,000 in the second. Since then, however, sales of the full-size sedan have dropped heavily as other vehicles, including the new Buick Lucerne, the Ford Taurus, and the Ford Fusion, have gained ground in the market. The 2010 version of the 300 posted a record-low 37,116 units sold. According to Edmunds, many of its features, including its four-speed automatic transmission, have become outdated. In response to flagging sales, Chrysler introduced a completely overhauled 2011 edition of the vehicle. From the late 1990s through 2000, a series of horrible vehicle rollovers due to tire tread separation led to the recall of thousands of Firestone tires on Ford Explorers. While Ford and Firestone blamed each other for the debacle, the brand value of the full-size SUV has never been the same. Ford continued the line in several generations, with new versions being introduced in 2002, 2006 and 2011. With the release of the "fifth generation" Explorer this year, last year's model lost a significant portion of its value -- more than $11,000 in a single year. Ford's flagship muscle car had a major successful redesign in 2005. In that first year, the fifth-generation Mustang sold 160,000 units and more than 166,000 units the next. Those numbers began to dwindle toward the end of the decade, and the 2010 version sold less than 75,000 units. In an attempt to boost sales, Ford included so many upgrades to the engine, transmission, and other components, that it could almost be considered a new generation of Mustang. The 2011 version has won a series of awards, including making Car and Driver's Ten Best list. This has, of course, left the 2010 version in the dust, and while that year's Mustang received excellent reviews from both Consumer Reports and J.D. Power, it lost more than 30% of its value in the past year. The QX is Infiniti's full-size luxury SUV. The first generation ran from 1997 to 2003. A much larger version, built on the platform of a Nissan Titan pickup truck, arrived in 2004. It's one of the most expensive full-size SUVs on the market, but that model received poor reviews from J.D. Power, which gave it a 2.5 out of 5 for initial quality and overall performance. Horrible sales led in part to a complete redesign, and to better sales. The 2011 version sold 27.1% better this June than last, when it moved a measly 658 units, according toMotor Trend. But the resale value of the 2010 QX65 has dropped by nearly $20,000 in a single year -- the equivalent in value to a brand new 2012 Nissan Altima. The Cadillac STS suffered the same fate as the DTS in 2011: The line was discontinued after consistently poor sales. In 2010, the STS sold just 4,473 units, down 29,000 units, or 86% from 2005. The 2010 version of the full-size luxury car lost more than 31% of its value in a single year. Cadillac next attempt to crack the full-size luxury market will come when it introduces the XLS in 2012. The E-series wagon, Ford's popular line of full-size vans for passengers and freight, reached its 50th anniversary in 2011, which prompted a special edition of the van, including a variety of new accessories such as a built-in navigation system and HD radio. The 2010 version of the vehicle, while part of the same generation, has nevertheless lost nearly a third of its resale value. The 2010 version of the van also received poor reliability scores from J.D. Power. The car received a 2.5 out of 5 from J.D. Power for overall performance and design as well as for for comfort, and a 3 out of 5 for performance. In addition, a hybrid version of the Sonata was released in 2011, which may be one of the main reasons for the 2010 non-hybrid's precipitous drop in value. The 2010 Kia Optima is part of the second generation of the Hyundai-owned automaker's line of mid-size sedans. With only average or below-average performance and reliability scores from Edmunds and J.D. Power, the car had difficulty competing with incredibly popular mid-size vehicles as the Camry, Accord, and Civic. The 2010 version turned out to be the last of its generation, and the introduction of the completely revamped Optima in 2011 -- and a hybrid version -- caused the value of the one-year old vehicles to plummet. Dodge's legendary muscle car has seen many changes over the past half-century. The most recent generation, which ran from 2005 to 2010, sold moderately well but received horrible marks from Consumer Reports and other reviewers. The magazine gave the latest version of the vehicle a 2.5 out of 5 for initial quality, and 3 out of 5's for overall performance, design, and reliability. In 2011, Dodge introduced a new generation of the vehicle. According to Edmunds, the redesign features "a long list of improvements," including modified taillights, a new dashboard, and a sleeker body design.